Dauntless is a Norwegian-built ship, converted into an exquisite expedition yacht. 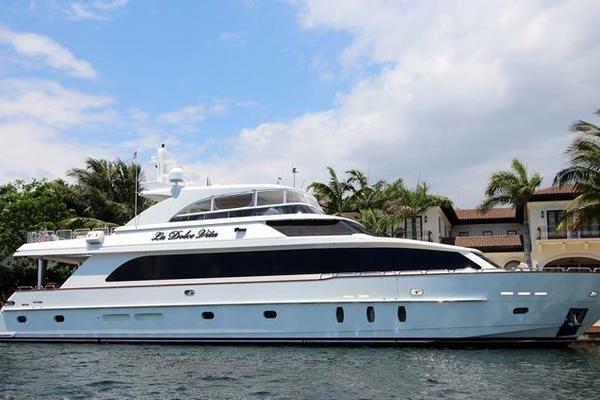 She has a full-displacement hull and low-revving diesels ideal for long passages in safety and comfort. Her twin Caterpillar diesels were chosen for their excellent fuel economy and durability. Dauntless features hydraulic stabilization, thruster and windlass. She has two davit cranes and two tenders. She is laid out with a spacious top deck master suite, a VIP cabin and two double cabins, all en-suite. There is also a crew area with galley/lounge, a head and three double crew cabins. Forward of the large and fully equipped galley is an adjacent lounge/library area. Below in the guest quarters area is a desk area for catching up on emails or lounging with one of the thousands of books, documentaries, CDs and movies in the digital library.She was originally converted into a luxury yacht in 1996. The current owner, a Marine Engineer, executed an extensive refit of Dauntless in March 2006. No expense was spared in her conversion into a serious expedition-style cruising yacht and the cruising design characteristics and features will make cruising comfortable for your whole guest list.Relax on her spacious aft deck for cocktails and then move to her formal dining area, with its beautiful 10 seat rich mahogany wood table. The flybridge is designed for excellent visibility, as well as socializing and gracious alfresco meals. With the tenders launched, the boat deck turns into an extended party zone and this deck is equipped with a sun lounge, a bar and a barbecue. Multiple social areas, including the foredeck and cockpit allow for many guests without feeling over-crowded. United Yacht Sales New Jersey would love to guide you through a personal showing of this 113' Custom Kristiansands Expedition Yacht Conversion 1960. This yacht for sale is located in Athens Greece and priced at $1,350,000. For a showing please contact us by filling out the form on this page and we will get back to you shortly! Dauntless has 'great bones' and she feels solid under foot, even in swells. She currently needs paint and new decking, but at the asking price, your savings will allow you to make quite a few improvements without busting the bank. And you’ll wind up with an amazing, global-ready vessel. With very little effort, she will be ready to tackle long distance cruising to any corner of the globe.Seller can deliver the vessel turn-key at an impressively modest mutually agreeable price.Contact broker for an extensive library of photos, general arrangement drawings and detailed specifications or to arrange for your inspection of the boat before it’s sold! Seller motivated and will consider creative and flexible price and terms.